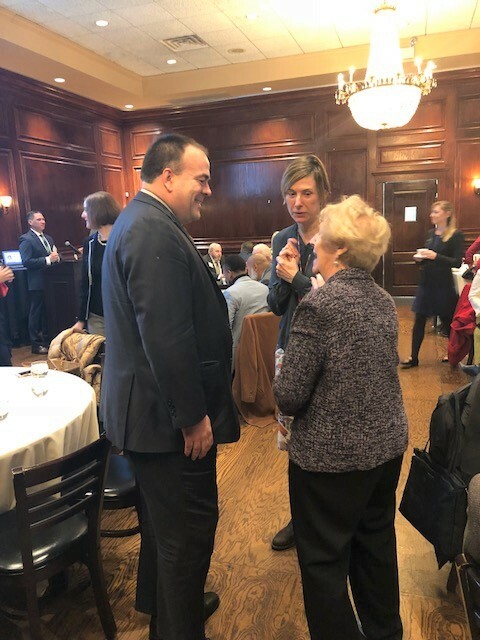 CommercialForum, the commercial division of the Chicago Association of REALTORS®, hosted a networking breakfast on Thursday, November 8th. Guest speakers discussed NAR’s current advocacy initiatives impacting commercial real estate, assessments in Cook County and other property tax issues. The first speaker was Erin Stackley, the Senior Policy Representative for Commercial Issues at the National Association of REALTORS®. Following the 2019 Mid-term Elections, NAR is closely watching which changes will be brought to committees that directly impact the real estate industry. Now that the House of Representatives is controlled by Democrats, there will be leadership changes in the House Financial Services Committee, the House Committee on Ways and Means, the Small Business Committee and the Transportation Committee. Erin made sure to note that NAR is nonpartisan and has strong working relationships with politicians on both sides of the aisle. There is no panic when there are party changes, just a watchful eye to figure out what the next steps will be. Typically thought of in terms of residential properties, the National Flood Insurance Program (NFIP) impacts commercial real estate, as well. The NFIP has been continued to be reauthorized every couple of months. Earlier this year, a bill came out calling for long-term reauthorization, with improvements to mapping technology and mitigation options. However, the Senate did not take up the bill. Still, the current reauthorization period ends November 30th, so something will have to be done once Senate returns from its lame duck session, at which point, there are two options: a short-term bill through early 2019 and passed as is, or a long-term bill passed with the reforms. NAR predicts that a short term reauthorization will be the immediate response, with long-term reauthorization and reform coming next year. Insurance Policy: Right now, the NFIP’s policy for commercial property is $1 million dollars, and most commercial properties end up having to purchase additional policies from the private market. NAR requests that the $1 million policy remains available for commercial properties, but that it’s no longer mandated. This would help commercial property owners in not having to purchase multiple policies. Flood Mapping Technology: In terms of flood mapping technology, NAR is seeking better coverage options, such as business interruption coverage and multiple structure coverage. There is a trend of attorneys and clients going around to businesses and hitting them with (alleged) Americans with Disabilities Act (ADA) violation lawsuits. The businesses and commercial properties often settle because it’s easier than going to court and lawyers collect the fees they were seeking. NAR’s problem with this is that it not only disrupts commercial real estate, but it also doesn’t further the goal of the ADA or incentivise fixing these infractions. Often times, owners are not even aware of the violations, especially if their business has passed inspection. Owners often assume that if they passed inspection, they’re also in compliance with ADA code. HR 620 was a bill that was presented earlier this year. It would have provided a notice to commercial properties that violated ADA code, giving them a narrow window of time to fix the violation. The bill passed the House, but had little support in the Senate due to opposition from civil rights groups. Now, going into a Democrat-controlled house, HR 620 will probably not pass at all. NAR is looking for more creative ways to get to the root of the problem, curb these lawsuits and educate owners on staying up to code. Some solutions discussed involve getting more funding for ADA regional centers so they can provide more education on ADA compliance and creating a “safe harbor” for businesses that can show they meet ADA code, thus giving them protections for such lawsuits. On both sides of the aisle, there is agreement that this is a problem to be fixed. Many online vendors do not charge sales tax. This creates an uneven playing field for brick and mortar retailers and ultimately takes away from the communities they serve. Earlier this year, the Supreme Court agreed that this was an issue and upheld a law that gives states the right to require online business to charge and remit sales tax on purchases. The problem is, the ruling was vague and gave little guidance to states on how to implement these requirements. Right now, some states are already writing laws that require online sellers to charge and remit sales tax; a lot of states will begin implementing them in 2019 to avoid confusion with taxes. NAR expects more court challenges on this in states that try to institute laws stricter than the one the Supreme Court upheld. As part of last year’s Tax Reform Bill, the IRS has announced that it will offer tax benefits for those who invest in distressed and disenfranchised communities or “Opportunity Zones” (as identified by the U.S. Census). 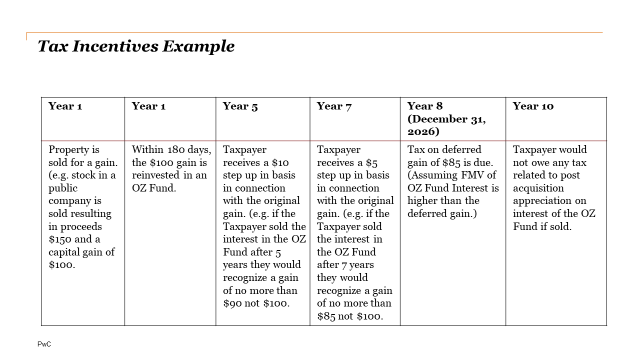 Essentially, if an investor takes capital gains and invests it into an “Opportunity Fund,” and then uses it in an Opportunity Zone within 180 days, then the investor will not have to pay taxes on those gains through the end of 2026. If money stays in the fund for five years, there is a 10 percent deduction on the tax paid on those gains. If kept in the fund for seven years, there’s an additional five percent deduction on the tax the investor pays. There are also benefits for keeping the money in the fund, because any gains accrued on top of the gains invested will be tax free if kept in the fund for at least 10 years. There will be some qualifications, but the program is designed to be user/investor-friendly, with self-certifications and easy forms to complete. The final rules for Qualified Opportunity Zones are expected to be released in Spring 2019. NAR is asking for more clarity on some of the rules and qualifications. A creation of the Tax Cuts and Jobs Act, this provision allows sole proprietors and owners of pass-through entities to claim a new deduction, up to 20 percent, on their qualified business income, within some limitations. When the bill came out, the language said that brokerages would be part of a select group of “specified service business” professionals that would be ineligible for the deduction. NAR wrote to the IRS and U.S. Treasury to say that real estate should be carved out of that exceptions. As a result, in the proposed rules released in 2018, real estate professionals are now eligible for the deduction. There are income thresholds for the deductions – $157,000 for singles and $315,000 for married couples. If below, then you may take the 20 percent deduction. If above, deduction phases out at over $50,000 for singles and $100,000 for married couples. The rules are still being written. One major question is how rental income will count toward qualified business income. At present, there are of lot of conflicting definitions as to what qualifies. After the attacks on September 11, 2001, insurance companies stopped offering terrorism insurance and the federal government created Terrorism Risk Insurance Program (TRIP). This made terrorism affordable and available to commercial properties. It was last reauthorized in 2015 and is due for reauthorization in 2020, which means it will have to taken up by the next Congress. NAR doesn’t expect any issues for the reauthorization. The bill giving tax deductions to energy efficient commercial buildings expired at the end of 2016, and in 2018 they reauthorized it, retroactively through 2017. NAR is hoping that at the end of the year, it will be part of a small extender package. 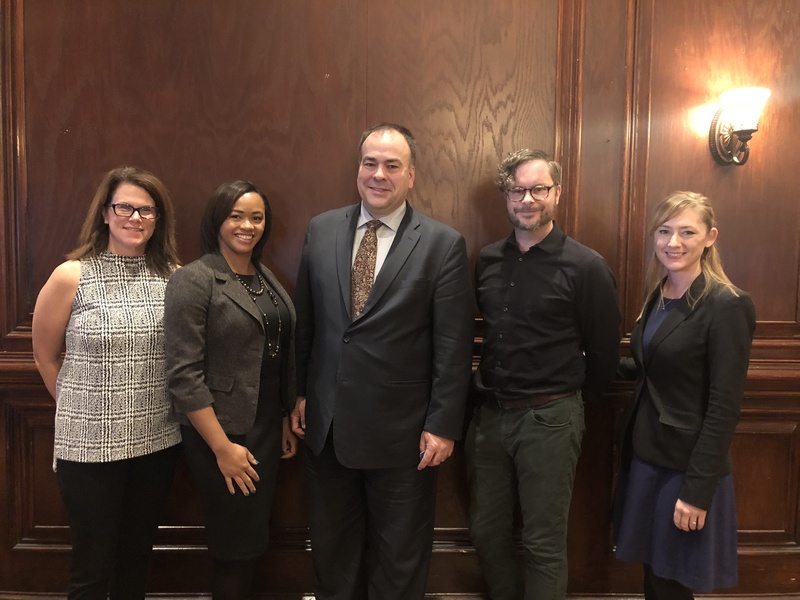 Just two days after handily winning the midterms with nearly 1.2 million votes, Fritz Kaegi, Cook County’s incoming Assessor, joined the CommercialForum Networking Breakfast. At the event, Fritz reaffirmed his commitment to bringing transparency, fairness and ethical standards to the Assessor’s Office. Fritz has made a career of “valuing things.” For the better part of two decades, he served as an international investor and equity market analyst. with thirteen years on the buyer’s side at Columbia Wanger Asset Management. In his global experience, Fritz has learned that real estate “has become less tolerant of local idiosyncrasies.” In Chicago, there’s painful idiosyncrasies in existence, he noted. Real estate used to consists of “local operators raising local money for local projects, all while taking advantage of local idiosyncrasies.” This used to be the best way to operate, and operators didn’t have to worry about equity markets and bond markets. However, things have changed. Now real estate operators are more national and global and those that continue to operate on idiosyncratic knowledge simply cannot compete. More and more, the U.S. is experiencing investments and financing from global operators, especially with low interest rates (despite the recent increases). In this kind of global market, Chicago’s idiosyncrasies get in the way and prevent the city from competing the way it should. At some point, investors will stop trying to learn and overcome the unique clauses and policies in Chicago’s systems when they can go to other cities whose policies represent transparencies and best practices. The job of the Assessor’s Office is to estimate the market value in all real estate in Cook County and properly divide up the $14 million levy. This is done by looking at the available data (e.g. attributes, building income, occupancy rates, transaction data). When done correctly, this data is published and shared, given to operators to conduct business locally and globally. Fritz noted that although that is the goal, that is not what is always done. There are times when an Assessor’s Office does not prioritize transparency and fairness, but instead tries to achieve favorable outcomes for a select few, making the market harder for the majority. Fritz says current statistics in Chicago are telling: “wickedly inaccurate and uncertain.” The accuracy of assessments is measured by the Coefficient of Dispersion (COD), which measures the deviation of assessment tax on the actual price paid on the market. The international COD guideline is to be below 20 percent. Last year, Denver, CO was at 16 percent; Washington D.C. was at 14 percent; Greater Houston Area was around 13 percent and Cook County was at 55 percent. This is an improvement from 2012-2015, when the average was 98 percent. Still, missing the average sale by over half is alarming and indicates that there’s work to be done. Another example of Cook County’s idiosyncrasies? The prevalence of appeals. Between a quarter and a third of parcels appeal. This is at least 10 times the number in other U.S. metro areas, and a newer study suggest that it may be even greater. This is a huge hidden cost in our system. Fritz also noted that many commercial properties in Cook County had not had their assessment updated at all. Chicago Tribune reported that two-thirds of parcels in Cook County had not been updated by a single dollar since the financial crisis of 2008, since which time neighborhoods and markets have significantly changed. While idiosyncrasies in Chicago’s operations do exist, all is not lost. The good news: there are great examples of best practices set by metropolitan areas throughout the nation. For example, Chicago can adapt Income and Expense Capitalization Approach, which many use when evaluating commercial real estate purchases or sales. This would mean that every commercial property has to fill out a form that outlines the property’s operational expenses and then submit the form online. The Assessor’s Office would then publish a table of cap and occupancy rates that are appropriate for each submarket where those buildings are located and Assessor’s Office will almost immediately send a preliminary assessment back. Fritz is confident that this process, overwhelmingly preferred by clients, investors and lenders alike, results in lower cap rates, a better investment climate and richer public data. The process also gives a fair assessment quickly and gives capital providers a lot more certainty about what the assessment level will be. Property owners will still be able to appeal, but now they’ll have stronger data to do so. The incoming office also plans to create a bill that requires property owners to publish the data. Then the Assessor’s Office will make sure data is on a public-facing platform. Fritz is confident that the new processes he’s bring to the Assessor’s Office will help REALTORS® better showcase their ability to think globally, understand how to control finances and risks and provide premium services to their clients. As a result, Chicago will uphold and advance its reputation as a world-class city able to compete in global real estate market. Molly Phelan joined us from Sigel Jennings, a national property tax law firm representing real estate funds especially for big box retailers. She gave an in-depth look at Illinois Property Tax Law and Valuation Theory. In speaking about the Illinois’ property tax and assessment process, Molly looked at the Sears Tower as an example. It fetched $1.05 billion in 2015 but assessed for $580 million. The value of a property must not be based on the recent transaction value, as other properties are not valued in the same manner. As a result, how are Cook County’s property taxes actually assessed and calculated? The biggest issue with the tax bill calculation is that the equalization factor is set by the state and the local tax rate is determined by the municipal government. If local government is not controlling its spending nor keeping in mind the impact on real estate, it’s detrimental. Understanding Fee Simple gives us a better understanding of what’s being taxed and why. First, Illinois is taxing the physical aspects – the parcel/lot of land, buildings, structures, etc. Then the Fee Simple estate is being taxed. That is the interest in land and improvement that is to be measured for real estate tax purposes. In other words, the owner has all the aforementioned rights of his/her property and may do with it whatever he/she wishes, with the exception of the government powers. Highest and Best Use – When looking at comparable homes to determine a fair assessment on your property, make sure that the highest and best use of the properties are the same, otherwise it will not be an accurate comparison. Cost Approach – This is a line item calculation of the value of the land and the cost to recreate the building. This approach is less reliable the older the building is. Sales Approach – This uses five or more comparable sales within the last three use to appraise the given property. One of the things to look at is the Fee Simple arm’s length transactions. In other words, are the sales between a willing seller and willing buyer? There’s also a difference between “value in exchange” versus “value in use.” What may be valuable to the current owner may not be as valuable to the potential buyer. Income Approach – This is based on the likely income of the property. Reconciliation – This takes all three approaches to determine the final valuation of the property, typically focusing on the sales approach. Brian gave an overview of the notice of three transfer taxes that would have impacted residential and commercial properties. With the help of CAR’s advocacy efforts, those transfer tax initiatives will not be on the February 2019 ballot. CAR reaffirmed our stance that the yield would not solve the issues that the transfer tax increases were intended to solve. For example, an alternative to fixing lead pipes could be adding a fee to the water bill, which would generate revenue from all households, including those surrounding Chicago and produce a greater pool of funds for remedying the issue. Beth Wanless addressed Prop 10 in California, the ballot initiative that failed in the mid-term elections. It would have expanded rent control throughout the state of California if it passed. The GADs watched it closely as there are ongoing rent control initiatives in Illinois and four proposals with the state legislator. There were three wards with rent control initiatives on the ballot and they passed, as they asked renters if they think there should be a cap on rent. Currently, Illinois is one of thirty-seven states with rent control prohibitions, which is proof of how many understand the destructive nature of rent control. CAR continues to watch the issues closely, seeking better alternatives and working with members and elected officials to keep rent control from becoming our reality. CommercialForum (CF) is the commercial division of the Chicago Association of REALTORS® and, with nearly 4,000 members, Chicago’s largest commercial real estate community. CF provides brokers, owners, managers, developers, REALTORS® and non-REALTORS® access to legislative influence, education & professional development, tools & resources, and networking opportunities. Learn more and get involved.